Those new to vegetable gardening may have difficulty sorting the vegetables from the weeds, especially when plants are young. But vegetables have distinct growth patterns and are easily recognized as they mature. Labeling vegetables with their names printed on craft sticks will help keep the garden organized and prevent mishaps during weeding. Vegetables can be sorted into several different categories. Some vegetables, such as lettuces, broccoli, peas and carrots, are cool-season crops. These crops are planted early in the spring and don't tolerate heat well. Other crops, such as tomatoes, peppers, corn and beans, are warm-season crops. They grow in the heat of summer until fall frosts kill them. Additionally, vegetables are used for their roots, their fruits or their leaves. The time of year a crop is growing can be a clue to identifying it. Early crops are planted in late March or early April in temperate zones and include leafy greens, such as kale, lettuce, spinach and Swiss chard, and root vegetables, such as onions, carrots, beets and radishes. Additionally, peas are planted at this time. June and July is the time to watch for warm-season crops, such as melons, tomatoes, peppers and eggplant. Leaf size and shape is another method of identifying a vegetable plant. All vegetables in the cucurbit family have large, round leaves with deeply cut leaves. The leaves of cucumbers and cantaloupe are 3 to 4 inches across, while pumpkin and squash leaves may be 6 to 10 inches wide. Tomatoes, beans, peppers and eggplant have leaves that are 2 to 3 inches wide. Fruit-forming vegetables, such as tomatoes, peppers, beans and eggplant, produce a central leader stem, similar to a shrub, with lateral branches that form from the main stem. Root vegetables, including carrots, potatoes, radishes and beets, produce a few main stems protruding from the soil with lots of leafy growth. Onions and chives produce tall, spear-like leaves. Climbing vegetables, such as pole beans and peas, are simple to identify because they have clinging vines with simple leaves. Vegetables grown for greens produce a mass of leaves protruding from the soil. Most of them don't produce stems. The leaves of newly emerging plants may look different than the mature leaves that unfold a few days later, making identification difficult. 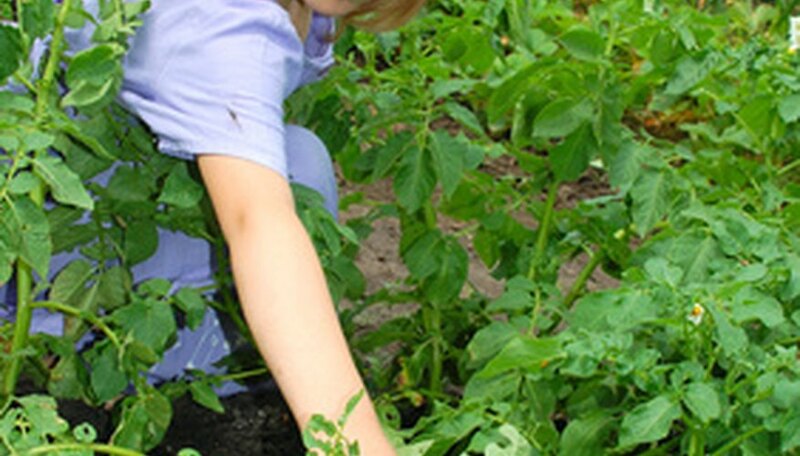 Some young vegetable plants may resemble weeds. When in doubt, gardeners should wait a few days before pulling an unknown plant.